“Be Encouraged, Be Inspired, and Be Motivated to Keep Looking Up” from Christian Faith Publishing author B. Wright-Jones helps readers uncover their purpose when they feel lost. All believers have a purpose ordained by God. “Be Encouraged, Be Inspired, and Be Motivated to Keep Looking Up”: a Christian guide to finding purpose. “Be Encouraged, Be Inspired, and Be Motivated to Keep Looking Up” is the creation of published author, B. Wright-Jones. B. Wright-Jones has a mission and purpose to encourage others. Inspired by the daily blog she started in 2014, “Be Encouraged, Be Inspired, and Be Motivated to Keep Looking Up” is intended to bring hope, faith, encouragement, inspiration, and motivation to readers. She always ends her blog posts with the phrase, “Keep Looking Up,” which is the exact message she has for every reader of her book. Published by Christian Faith Publishing, B. Wright-Jones’ new book helps readers find their Godly purpose. God has a good plan for the lives of everyone, but everyone needs a little help from time to time in finding their purpose. The purpose of “Be Encouraged, Be Inspired, and Be Motivated to Keep Looking Up” is to share real-life struggles and experiences to help others when they have lost sight of their purpose. For those who need a little help and encouragement, this book is for them. 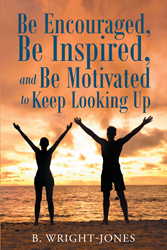 “Be Encouraged, Be Inspired, and Be Motivated to Keep Looking Up” will inspire readers to believe in themselves, even when faced with doubt. It will motivate readers to trust and believe in the Lord. Readers will learn to look up to God for guidance and purpose. View a synopsis of “Be Encouraged, Be Inspired, and Be Motivated to Keep Looking Up” on YouTube. Consumers can purchase“Be Encouraged, Be Inspired, and Be Motivated to Keep Looking Up” at traditional brick & mortar bookstores, or online at Amazon.com, Apple iTunes store, Kobo or Barnes and Noble. For additional information or inquiries about “Be Encouraged, Be Inspired, and Be Motivated to Keep Looking Up”, contact the Christian Faith Publishing media department at 866-554-0919.